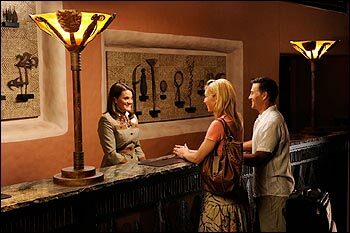 Arriving prior to your check-in time is a great thing to do. All resorts will allow you to check in starting at 6:00AM. Disney will check your bags, prepare your resort ID's and allow you to purchase your theme park tickets. When your room is ready, they will text or call you with your room number. Many people arrive before park opening time at their resort, check-in, enjoy a full day at the parks and then pick up their room number on their way back. Check-out time at all resorts is 11:00AM. Late Check Out: Late check outs can be accommodated based on availability. In order to request late checkout, call Housekeeping from your room telephone 24 hours on the day before your departure. Late check out can be anytime between 11:00AM and 1:00PM.